The Chair, supported by the Vice-Chair, leads the Steering Group, gives it strategic direction and is in charge of the overall organization of its proceedings. Germany directed the Steering Group for 1,5 years (July 2016 – December 2017) with Bangladesh as Vice-Chair. In January 2018, Bangladesh took over the Chairmanship of the Platform with France acting as Vice-Chair until June 2019. It will then be France’s turn to assume the Chairmanship with a new Vice-Chair. The Steering Group contains between 15 and 20 States and the European Union, represented through their Permanent Missions in Geneva. Its composition reflects a wide and balanced geographic representation. The Office of the United Nations High Commissioner for Refugees (UNHCR) and the International Organization for Migration (IOM) are standing invitees to the Steering Group. 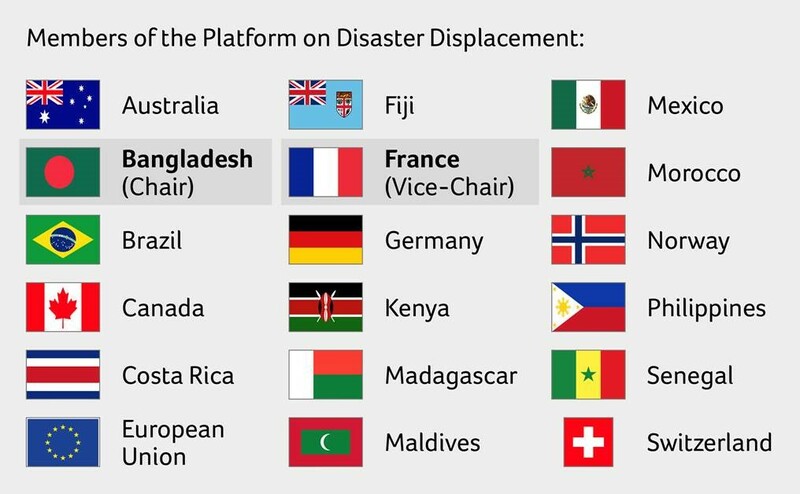 Members of the Steering Group of the Platform on Disaster Displacement include : Australia, Bangladesh (Chair), Brazil, Canada, Costa Rica, European Union, Fiji, France (Vice-Chair), Germany, Kenya, Madagascar, Maldives, Mexico, Morocco, Norway, Philippines, Senegal, Switzerland. The Steering Group directs and steers the work of the Platform and related efforts at the global level on the basis of an approved Strategic Framework and Workplan. 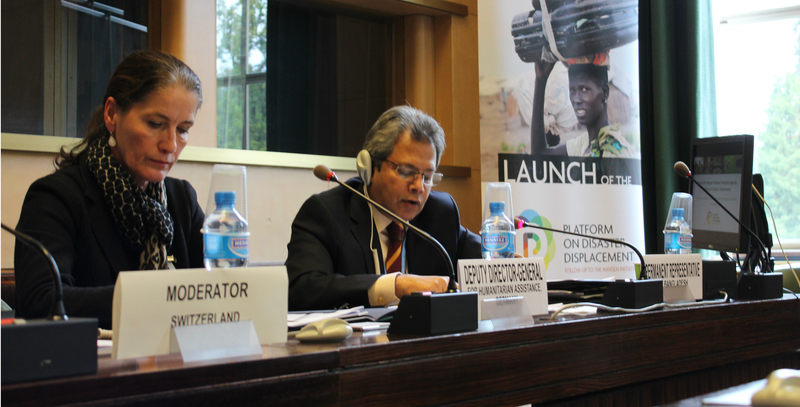 The function of the Steering Group includes the following: 1) Provide political support and commitment to raise awareness on disaster displacement and to disseminate and implement the Protection Agenda, 2) Participate actively in the promotion and development of policy priorities and policy interventions, and 3) Lend leadership and guidance in the development of the strategy of the Platform. The Chair (Bangladesh) organizes regular meetings of the Steering Group in Geneva at technical and ambassadorial levels, and shares minutes with members. There is the possibility to meet in working groups on specific aspects. Meetings are called by the Chair and supported administratively by the Coordination Unit.